Matt, while new to Richmond, is a long time term car nut. 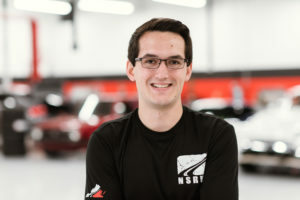 Having relocated from Atlanta, GA, Matt was the Manager of a local performance shop by day and time attack racer by night. Over the years, this racing bug developed into a full-blown passion for making cars perform better. Currently, Matt holds the National Speed record for most hours logged at a single track – a whopping 1,500 hours a AMP. Needless to say, Matt gets it. As Assistant AGM, Matt brings his unique background and skill set to the table each day, ensuring every customer has the same great experience time and time again. His insight from his previous roles has allowed him to implement new processes and strategies that help National Speed offer a consistent and enjoyable experience. We look forward to watching Matt grow and helping us change the industry along the way!